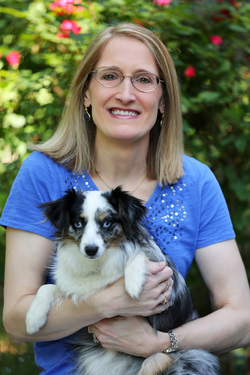 Cindy Sommer with her dog, Pepper. Hi, I'm Cindy Sommer, and I live on the north shore of Long Island, New York. I've lived here all my life. I've always loved reading and writing books and stories. I was drawn to horses in elementary school. 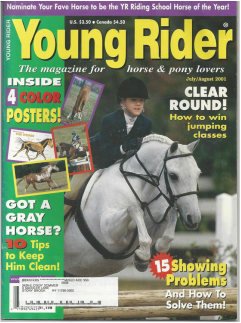 My days were spent taking riding lessons, and reading magazines and books about horses. 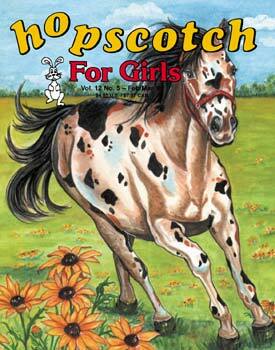 I read every Black Stallion book there was, and Marguerite Henry's Misty books. I dreamed of someday writing books like these. I grew up with a younger brother. We were always outside. We enjoyed camping, hiking and canoeing together with our parents. Our mother loves nature, and passed this on to us. She still refuses to kill any bug, including a large June bug that bit her as she was rescuing it! I had many jobs in my teenage years, including delivering local newspapers by bicycle, turning on televisions for patients in a hospital, and filing paperwork at an insurance agency. None involved books. I pursued my love for literature in college where I earned a BA in English from SUNY Oneonta. I also received a Business minor. This would help me in my career as an insurance broker after I graduated. Done with school, I married my junior-high sweetheart, and we worked together at our insurance agency. But I always wanted to write. While I was working I never found the time. Once we had our first daughter, I discovered I had time while she napped! 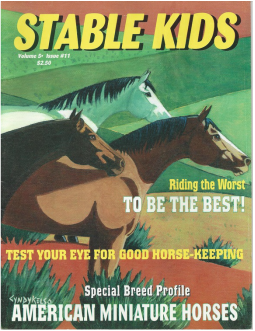 I sent out my first horse story to Stable Kids magazine, where they immediately called to tell me they wanted to publish it! I was hooked. Later on, I sold second rights to that story to Hopscotch magazine. I also sold stories to Kids' Highway ezine, Young Rider magazine, and Newsday's Parents & Children newspaper. Having two young daughters meant having A LOT of picture books in the house. I thought to myself, I can write these, no problem. Boy was I wrong. Picture books are NOT easy to write! I found that out the hard way...rejection after rejection after rejection. One story I wrote racked up 25 rejections! Did I give up? No! I joined a wonderful writer's group, the Long Island Children's Writers and Illustrators, where I am now the current Treasurer, as well as the Society of Children's Book Writers and Illustrators. I attended conferences and signed up for many picture book writing classes. Finally, Arbordale Publishing gave me the opportunity to publish my first book, Saving Kate's Flowers. Hooray! I can't wait for everyone to read it! Saving Kate's Flowers has won the 2017 Crystal Kite Award from the SCBWI!!! Click on Books to see it. You can also visit Arbordale's website to see more of their amazing books. To see the illustrator's amazing pictures, visit Laurie Allen Klein's website. I would love to be part of your event or provide an Author Visit to your school, library, summer camp, museum, or farm. Kids especially from ages 3 to 5 love to hear my book and see my program, where kids become seeds that grow into plants. However, I will only travel to Nassau and Suffolk County locations. To contact me directly, please view my Contact Page. Or you can view my brochure HERE. To see my Facebook page, click HERE. I have several picture book manuscripts ready for acquisition. Please contact me to see one of the many stories I have that are waiting to find a publisher. Cindy's first published work appeared in this magazine. Cindy jumped for joy when this magazine wanted to re-print her first story. This magazine had Cindy change her cat to a dog in the story.